FORT LEE, Va. (March 16, 2009) -- Like a scene from "Iron Chef" or perhaps "Hell's Kitchen," Soldiers in whites scrambled against the clock to prepare meals for patrons they knew would eat only a bite before waving it away. The Soldiers were Army cooks participating in the 34th Army Culinary Arts Competition, March 2-13, at Fort Lee, Va. The event -- the Student Skills Competition -- was one of many challenges during a two-week competition to recognize the best of military cooks. Pfc. Anthony Patterson of Fort Bragg, N.C., prepares a desert during the Student Skills Competition as part of the 34th Army Culinary Arts Competition, March 2-13, at Fort Lee, Va. Army cooks participated in two-week culinary event which featured more than 40 different categories of competition that touched on such things as ice carving, pastry, nutrition, cooking knowledge and field cooking. With staggered starting times, each of 10 teams of four military cooks -- nine representing the Army and one from the Coast Guard -- competed against the clock to prepare a four-course meal for four. Each had had 90 minutes to prepare, plate and serve an appetizer, a salad, an entrée and a dessert. The "diners" included judges from the American Culinary Federation, who ranked each teams' offerings on timeliness, taste and presentation. Pacing back and forth from kitchen to kitchen were roving judges who took note of how individual cooks used their knives, chopped their vegetables, and maintained food safety. "It's chopping, slicing, cutting -- you better know how to do it, because the judges check every detail," said Pfc. Heriberto Cruzmejia, of the Fort Bliss team. "Everything has to be perfect. Everything the same length. Perfect. Everything. They got me on that." Cruzmejia said the most important part of the competition was timing. "You have to be quick, you have to know your stuff," he said. "You have to know what you're doing or you will be lost out there and lose all your time." The event was grueling, with team members mopping sweat from their foreheads, shouting out orders, bumping into each other, occasionally jumping back from flame-ups on the stove top and always checking the clock. All the while, teams worked to turn out pastries, salads, and dishes with names like "Paupiettes de Sole a la Trouvillaise" and "Poulet Sauté Bercy" -- all recipes pulled from the classic French guide to cooking "Escoffier: Le Guide Culinaire." The book in itself is a challenge, said Chief Warrant Officer 4 Travis Smith, a food advisor at the 1st Infantry Division, Fort Riley, Kan.
"It's like the bible of French cooking," Smith said. "It's very specific. You look up one recipe in there and all of the sudden you find yourself -- it's referring you to like five or six other recipes. And each one of those refers you to another recipe or two. So you learn about 15 recipes just by making one dish in Escoffier." Smith didn't actually participate in the Student Skills event, though he was on the Fort Riley team. Instead he served as an advisor -- bringing his years of experience with him. He originally came to Fort Lee to compete for the U.S. Army Culinary Arts Team in 1991, and at one point in his career was responsible for management of the culinary arts program at Fort Lee, within the crafts skills training branch. He's participated in the competition off and on since then, and said students participating in the Student Skills Competition have to exhibit competency in a number of skill areas. "They have to exhibit a high level of skill in knife skills, butchery skills, proper cooking techniques and methods, proper doneness, flavor, taste, texture, food service, proper temperature, excellent organization and timing skills, team work and hygiene -- it's a variety of things," he said. 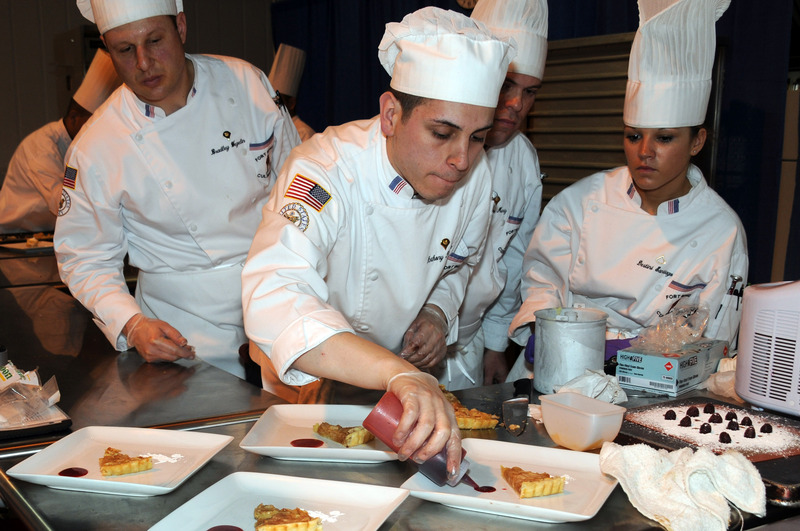 The competition is challenging for young Soldiers who serve as Army cooks. "It's heart pounding," said Pfc. Matthew Hendriks, of the U.S. Army Europe team. "It's fun though -- it's exhilarating. I've never been this nervous." Hendriks has been in the Army for less than a year, and actually left culinary school on Fort Lee in August 2008 for his first assignment in Manheim, Germany. "If you told me then I was going to be here for this I'd probably have laughed," he said, saying while in AIT he'd only heard about the competition. But he also says he has a passion for cooking and plans to make a career out of it. "Army is the career I want to do, and as far as culinary arts, I want to take it to its furthest point," he said. "I usually walk down the spice aisle and I just pick something -- I can spend an hour in the spices aisle -- but my girl hates it." Spc. Christopher Bohn was part of the Hawaii team, which eventually won the Student Team Skills Competition. He said the team had to work through some challenges to complete their dinner service on time. "There's the pressure -- watching the judges look over you with their little notepads -- that really throws you off," he said. "And the oven failed us, that slowed a lot of things down. But you are supposed to monitor throughout with your thermometers." The team also operated without their planned leadership, because the team leader they expected to be on hand for the competition was "under the weather." Still, Bohn said, the team pulled together for the competition. Their team work eventually gave them the win. "It's our ability to work together and to yell at each other and accept it as constructive criticism," he said. "We love each other like brothers and sisters." The team's menu included sole, a "decent spring green salad," and a chicken dish, Bohn said. "The pièce de résistance is definitely the chicken roulade and sausage," Bohn said, adding that the team went through their routine twice to get it down. Bohn said he plans to be an Army lifer, and hopes to go on to run an officer's club or his own restaurant after his service. In addition to the Student Skills competition, the two-week culinary event featured more than 40 different categories of competition that touched on such things as ice carving, pastry, nutrition, cooking knowledge and field cooking, said Lt. Col. Rob Barnes, director of the Army Center of Excellence, Subsistence at Fort Lee. "We used the containerized kitchen -- our Soldier teams come out and cook five-star meals from a field kitchen," he said. The public was invited to partake of the food cooked by Soldiers in the field cooking competition -- though the meals were different than the fare normally served in the field. "Once you walked into the tent you'd think you were in a five-star restaurant," he said. "The public completely enjoyed it." Barnes said the competition at Fort Lee, home of the Army's Culinary School, is designed to improve the overall food service program for the Army. "They take some of these things they learned to make their dining facilities better," he said. "Also to get them to show more appreciation to the Soldiers. When the warfighter is out there in the field, the one thing that means the most to them is when they eat their food. They may be tired, they may miss their loved ones -- but I'm telling you, if that food is spot on, that saved the day." • Armed Forces Junior Chef of the Year: Spc. Javier Muniz, Fort Bragg, N.C.
• Nutritional Hot Food Challenge: Fort Bragg. N.C.
• Best Exhibit in Show (Cat A, Cold Platter): CW4 Travis Smith, Fort Riley, Kan.
• Best Exhibit in Show (Cat. C, Patisserie/Confectionery): Sgt. Orlando Serna, Fort Bragg, N.C.
• Most Artistic Exhibit in Show: Sgt. Orlando Serna, Fort Bragg, N.C.
• Best in Class - Contemporary Cooking (Cat K): CW4 Travis Smith, Fort Riley, Kan.; Sgt. Michelle Carville, Fort Myer, Va.
• Best in Class - Contemporary Pastry (Cat P): Sgt. Orlando Serna, Fort Bragg, N.C.
• Army Junior Enlisted Aide of the Year: Sgt. Michelle Carville, Fort Myer, Va.